Through its Open Collections Program, the Harvard University Library is presenting new, virtual collections of thematically linked material selected from numerous Harvard repositories. For the study of the ancient world, the Expeditions and Discoveries: Sponsored Exploration and Scientific Discovery in the Modern Age provides access to field notes, letters, maps, photographs, and published materials relating to a range of worldwide expeditions from 1626 to 1953. Between 1935 and 1953, the Carnegie Institution of Washington excavated Kaminaljuyú and established it as one the most significant archaeological Pre-Columbian sites in Mesoamerica. Kaminaljuyú (meaning, in the Quiché language, "Hills of the Dead") grew from an agricultural community (ca. 2500 BCE) in the central highlands of Guatemala to become a large ceremonial site and political Maya capital that flourished until about 800 CE. Harvard’s Committee on Exploration in the Orient designated the American archaeologist George A. Reisner to direct the University’s expedition to Samaria. With sponsorship from Jacob H. Schiff, the expedition was intended to excavate the site of Samaria (Sebaste), which was the capital of the ancient Kingdom of Israel. Reisner located remains of the royal palace built by Omri and Ahab during the Israelite period, as well as remnants of buildings constructed during later periods of occupation by Babylonians, Greeks, and Romans. Noteworthy among the artifacts found were ostraca, or pottery fragments, depicting Hebrew-character inscriptions in carbon ink of Biblical names and memoranda of commercial shipments. Through the Islamic Heritage Project (IHP), Harvard University has cataloged, conserved, and digitized hundreds of Islamic manuscripts, maps, and published texts from Harvard’s renowned library and museum collections. These rare—and frequently unique—materials are now freely available to Internet users worldwide. IHP is made possible with the generous support of Prince Alwaleed Bin Talal. subjects, including religious texts and commentaries; Sufism; history, geography, law, and the sciences (astronomy, astrology, mathematics, medicine); poetry and literature; rhetoric, logic, and philosophy; calligraphy, dictionaries and grammar, as well as biographies and autobiographical works. Other collections represent botanical and zoological collecting expeditions. The Center for Celtic Studies at University of Wisconsin-Milwaukee publishes the electronic journal e-Keltoi: Journal of Interdisciplinary Celtic Studies. The journal is an integral part of the Center's mission to promote and disseminate research and communication related to Celtic cultures, past and present, in the academic arena as well as for the general public. Web resources on Celtic Culture that are content-rich, reliable and current are rare, and are very much in demand. The journal provides free access to cutting-edge, peer-reviewed articles solicited to address specific themes from a range of cross-disciplinary and international perspectives. The goal is to make full use of the electronic medium in a way that cannot be equalled by print journals due to cost or formatting constraints: numerous full-color images per article; video and audio clips; links to other sites embedded in the text; etc. The Celtic world is an especially rich source of graphic images, material culture, and oral as well as performative traditions, all of which can be presented especially effectively in an electronic format. Members of the Cuneiform Digital Library Initiative, supported in part by a generous grant from the Mellon Foundation (project: Creating a Sustainable Digital Cuneiform Library), have collaborated with leading experts in Old Assyrian studies to coordinate the digital capture and web dissemination of Old Assyrian documents held in numerous public and private collections worldwide. These clay tablets, excavated in modern Turkey, record the 20th century BC dealings, personal and professional, of a set of traders from the distant capital city Assur, and have for many decades been at the center of an extended discussion of long-distance trade in the ancient world. In total, more than 4650 transliterations of Old Assyrian records were made available to CDLI by specialists in Old Assyrian research. The conversion of these legacy files to CDLI's ASCII Transliteration Format (ATF) required a substantial effort by project collaborators Jacob Dahl (Oxford), Bob Englund, Marjan Yahyanejad (both UCLA), and Steve Tinney (UPenn). We are acutely aware of the fact that, despite our work, these transliterations still contain a substantial number of errors, both those remaining from original files and those introduced through our automatic and manual text conversion. In particular, irregularly coded text preservation markers resulted, in conversion, in the designation as broken (with brackets [...]) of transliteration that is in fact preserved on the text. Further, the important word separators (small vertical wedges, designated in our files with the forward slash "/") had to be reconstituted after a conversion error, and some number may have been missed in correction. These errors will in time be removed by further collation with the original files, or by exploiting the increased online access to hand copies and to images of original tablets (below). But the now fairly consistent transliterations represent a substantial new set of research tools for specialists as well as for web users with general linguistic interests, and it would make no sense to us to withhold them from general web access due to the caveats we feel we should make to users. In conjunction with the conversion and processing of transliterations and catalogue entries, CDLI staff and collaborators in Los Angeles, Berlin and Oxford have begun with the processing and posting of image data documenting the corpus. The inclusion in CDLI pages of available published hand copies of texts, and of images of original tablets, facilitates the ongoing transliteration and collation work of collaborators in this project. Line art copies are being processed by UCLA staff, while Jacob Dahl (Oxford) and Mellon postdoctoral associate Christina Tsouparopoulou (Max Planck Institute for the History of Science, Berlin) have imaged some numbers of original tablets. The full Old Assyrian digital files of CDLI (currently ca. 5550 entries) are viewable at http://tinyurl.com/yzqewkt, and we have put up a complete text file of available and converted Old Assyrian transliterations, together with sign and word lists, at http://cdli.ucla.edu/downloads.html; we note that Steve Tinney is preparing an updated RTF convertor for ATF files that will produce nicely formatted text processor (RTF) facsimiles of transliterations for use in publications. Any assistance that AWOL readers can give us in scanning, or merely in gaining access to further Old Assyrian exemplars so that CDLI can perform their digital capture, would be greatly appreciated. The following Current Issues Links have been added to the JSTOR archive. The Cooperative Digital Resources Initiative of the American Theological Library Association and Association of Theological Schools is a repository of digital resources contributed by member libraries. The creation of CDRI was made possible by a generous grant from the Henry Luce Foundation; it is now an ongoing ATLA program. The CDRI database provides access to digital images of woodcuts, photographs, slides, papyri, coins, maps, postcards, manuscripts, lithographs, sermons, shape-note tune books, and various forms of Christian art, architecture, and iconography. Fornvännen är Sveriges äldsta, största och ledande tidskrift då det gäller antikvarisk forskning och har Nordens största recensionsavdelning inom ämnet. Utgivningen startade 1906. I Fornvännen publicerar sig den skandinaviska arkeologins och medeltidsforskningens främsta experter. Fornvännens artiklar är skrivna på svenska, ibland också på danska eller norska, men från 1925 finns bildtexter och sammanfattningar på engelska eller tyska. I äldre årgångar förekommer det att artiklar på engelska eller tyska har en svensk sammanfattning. I senare årgångar får icke engelskspråkiga artiklar en summary på engelska. Läs mer om Fornvännens historia i artiklarna som vi länkat till nedan. Welcome to Before Farming, the journal designed for archaeologists and anthropologists researching hunter-gatherers past and present. The online journal is quarterly, published by the Western Academic & Specialist Press. Each year a paperback volume is published. This is a compilation of the previous year's online issues. Because it is not always possible to transfer all elements of the online version directly to print this volume is not an exact reproduction of the online version of the journal. The first two online issues of Before Farming are free to view and download. Please note that although the format of these two issues is similar to later issues of the journal the title and scope of Before Farming has since changed. Formerly concerned with "the archaeology of Old World hunter-gatherers" the journal is now expanded to encompass "the archaeology and anthropology of hunter-gatherers" with no geographical or temporal restrictions. Please bear this in mind when perusing these issues. Saudi Aramco, the oil company born as an international enterprise 75 years ago, distributes Saudi Aramco World to increase cross-cultural understanding. The bimonthly magazine's goal is to broaden knowledge of the cultures, history and geography of the Arab and Muslim worlds and their connections with the West. Saudi Aramco World is distributed without charge, upon request, to interested readers worldwide. In print, Saudi Aramco World is published six times a year: January/February (JF); March/April (MA); May/June (MJ); July/August (JA); September/October (SO) and November/December (ND). From its launch in 1949 until the May/June 2000 issue, the magazine's name was Aramco World. The July/August 2000 issue was the first to carry the name Saudi Aramco World . In 1995 a suggestion was made to establish the Polish Association for Jewish Studies, which would have as its main goal the consolidation and integration of scholars and institutions involved in Jewish Studies. In February 1996 the Polish Association for Jewish Studies (PAJS) was registered in Cracow. Statutory aims of PAJS are the promotion and popularization of scholarly research on Jewish history and culture, with particular attention to the history of the Jews in Poland, and the development of cooperation with Polish and foreign institutions and associations. OIP 54. The Mortuary Temple of Ramses III, Part 1. The Excavation of Medinet Habu, Volume 3. OIP 41. The Excavation of Medinet Habu, Volume 2: The Temples of the Eighteenth Dynasty. By Uvo Hölscher. Originally published in 1939. Das Internet-Magazin Spuren der Jahrtausende (www.spuren-der-jahrtausende.de) der Römisch-Germanischen Kommission informiert über aktuelle Forschungen aus dem Bereich der vor- und frühgeschichtlichen sowie provinzialrömischen Archäologie. 6-2008: Steinzeit in der Wismarbucht. As of this morning the number of email addresses subscribed to The Ancient World Online by way of the FeedBurner utility has passed six hundred. I'm pleased that so many of you find it useful enough to subscribe. I welcome your feedback in the form of comments on in individual posts, or directly. I am considering ways to make the data presented here more bibliographically accessible. Here at the ISAW Library we are developing schemes to create MARC records for the open access resources for which such records are appropriate. I am also considering developing a publicly accessible Zotero bibliography parallel to AWOL. For those of you who have not already seen it, I would like to draw your attention to the exhibition at ISAW which opened earlier this month. 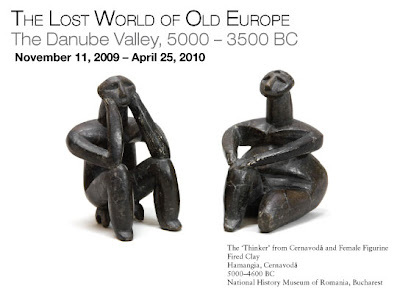 Lost World of Old Europe Exhibition Website.